I just tried out this great service called Cards for Coaches. This is a really neat website where you can get great well made cards for you children’s different coaches. My kiddos are in so many different activities that it’s really hard for me to keep up. However, I always make sure that I get every coach a card at the end of the season and some kind of small gift. It’s so important to have kids involved in activities these days and the people that volunteer to lead them are a gift so I always want to make sure they know I appreciate them. Cards for Coaches is great because you can hope on the website and find great looking cards that are sports themed to give to your coaches. You can either get a generic card or you can actually pick a specific sport! They have cards for Baseball / Basketball / Cheerleading / Dance / Football / Generic / Golf / Hockey / Soccer / Swimming / Tennis. They have really nice graphics and look really nice, they are made of a heavy card material and come with an envelope! I love that the inside of the card provides a big open space so if you want to give a card from the entire team you have lots of room for the team members to sign! Without coaches there would be no team to play on, and no sport to play. Regardless of skill level, and regardless of how serious the athlete or the parent….the Coach is there to devote his or her time to developing young athletes. Though not every coach, team, player, or athlete is successful at winning all the time…they are always successful in dedicating their time and efforts to making your son or daughter a better competitor. Cards For Coaches is here to help you appreciate and thank the coaches in yours and your children’s lives. I speak from experience when I say a little token of appreciation…goes a long way. Cards for Coaches Thank you Cards. Don’t Forget to Thank the Coach. These are Perfect Appreciation Cards to say Thanks to that special coach. 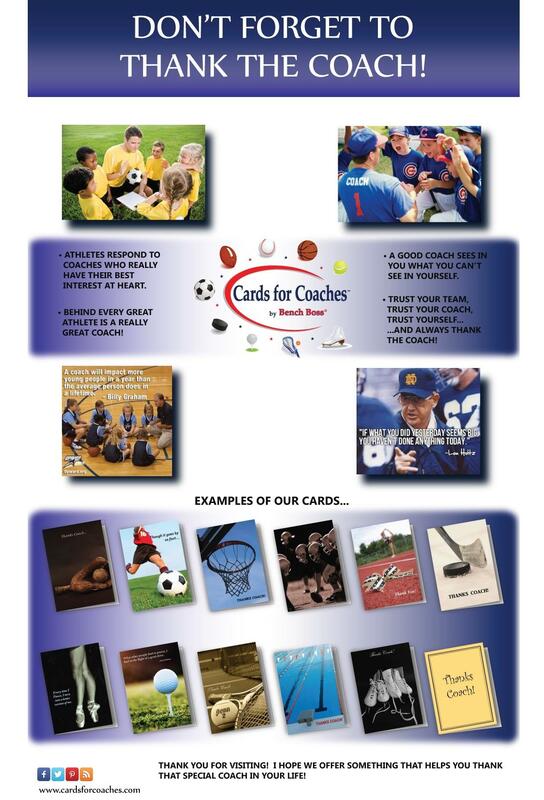 Cards For Coaches is here to help you appreciate and thank the coaches in yours and your children’s lives. You can find Card for Coaches on their Website & Amazon!